I have a love/hate relationship with Liquorice. Living in Scandinavia and The Netherlands has made me used to seeing it pop up in unusual mixtures and places. I’ve become used to eating a general looking sweet and discovering the strong flavour of liquorice or a whole piece hidden inside. In Ireland we don’t use this flavour too often, it’s usually only in the form of garish liquorice allsorts. I’m not a big fan, but it has grown on me with it’s unusual intense flavour and at times I have even enjoyed it. In the form of ice cream is a way in which I can appreciate it, and when served with this pumpkin puree I think it really smooths out and balances the ice cream. Thanksgiving is just around the corner and although we don’t celebrate it here in Ireland, I always like to make something pumpkin based around this time of year. Probably because my news feed is covered in amazing pumpkin inspired recipes, sweet and savoury. 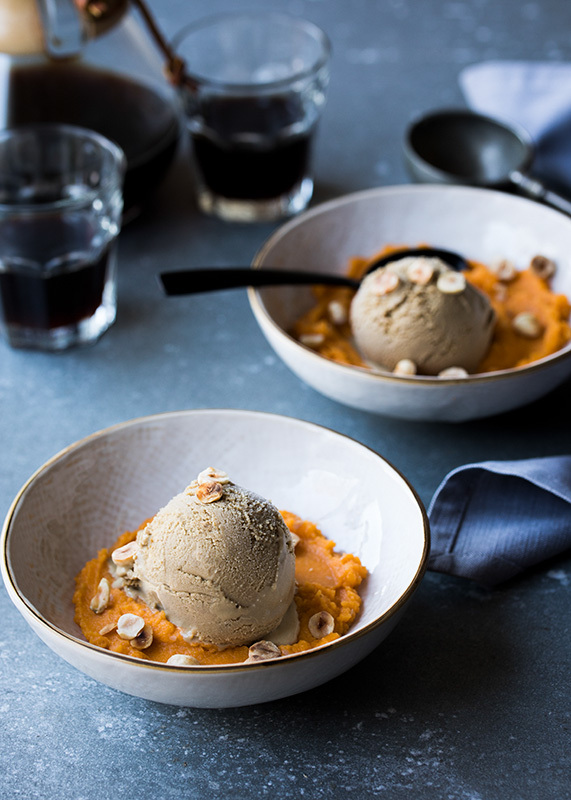 So here is a liquorice ice cream with a sweet pumpkin puree adapted from the beautiful cookbook by Mikkel Karstad, pick up a copy if you are a fan of Scandinavian cuisine or beautiful photography. *Liquorice powder might be something a little hard to find if you don’t live in Scandinavia or NL. I bought a good batch the last time I was in Copenhagen, but I have recently noticed it in different Tiger stores, they are pretty wide spread across Europe now. For the liquorice root, we generally have a few lying around the house as they are pretty popular in The Netherlands so Rob usually stocks up on them when we are back, but I think this is something you can look for in a health food store also. Start by making the ice cream. Place the sugar, milk, cream liquorice powder and salt into a saucepan and bring to the boil. While it’s heating, place the egg yolks into another medium to large mixing bowl. Give them a light whisk, just to combine them. When the milk mixture has come to a boil take off the heat and little by little add it into the egg yolks, constantly whisking. You don’t want to scramble the eggs so best to carefully and slowly add the milky mixture to the eggs. Take off the heat and leave to cool, stirring occasionally. It will thicken slowly, about the consistency of custard. This can be placed into the fridge and kept in an airtight container for about a week or eaten straight away with the ice cream. To serve, place a tablespoon or 2 of the puree on a plate or in a bowl and place 1 scoop of ice cream on top with a sprinkling of toasted hazelnuts.